Hi guys! How are your mint plants growing? Let's put some of the leaves to use in a bright, delicious lemonade. Meanwhile, juice enough lemons to get 1 1/2 cups of juice. Stir together the simple syrup, lemon juice, and 7 additional cups of water. Snip the mint leaves (or smash them with a muddler or wooden spoon to release the mint scent and flavor) and add them to the lemonade. Serve over ice. Enjoy! This is such a refreshing treat on a gardening day. Shortcut: add fresh mint to store-bought lemonade to give it a cooling kick. Hi guys! Are you participating in Me Made May? If you've never heard of it, it's an annual challenge to wear something you made every day for a month. This is my first year taking part, and I've only missed a couple days. Occasionally I just stay in lounge, workout, or gardening clothes all day. I haven't made much that suits those categories, so I haven't worn me-mades every day. It's been really fun to wear handmade clothes all month! I'm so inspired to make more and wear them all the time. My favorites right now are from Grainline Studio's patterns: the Scout tee, Lark tee, and Linden sweatshirt. These days, I love making basics out of fabrics that I will really wear all the time. I used to make dresses out of wild fabrics and crazy prints, and guess what? I almost never wore them. They were really fun to make, but they didn't get much use. Basics, on the other hand, get worn. (I'm still planning a couple of fun dresses, but I think I will wear them even with the more interesting fabrics I've chosen). I haven't used any of these patterns before, so it will be a fun adventure. I've used Grainline and Colette patterns quite a bit, so I'm pretty sure those will be successful. Blank Slate and Named are new to me, and I hope I'll like them! So far, my computers and printer absolutely HATED printing the Inari tee dress pattern. I had to spend a lot of time to get that simple pattern printed out. Hopefully it's not an omen. Are you sewing anything new for summer? Whew! That's a ton to plant. 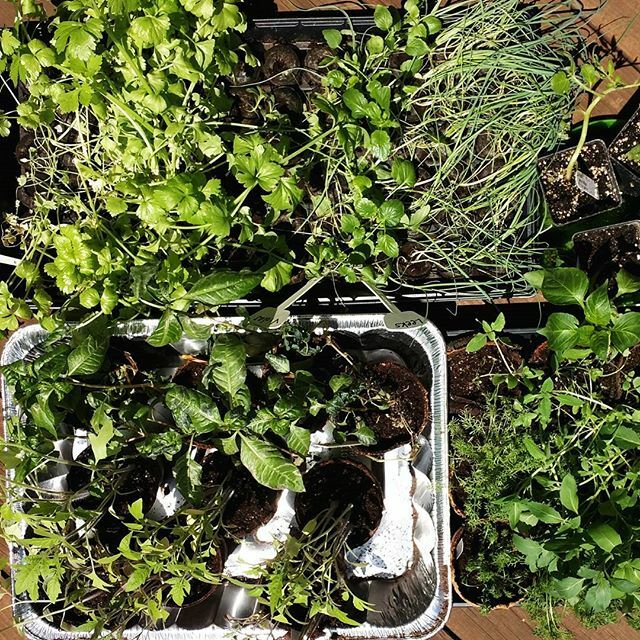 This is going to be a fun summer and I can't wait to eat, drink, and use all the produce from these plants. Hopefully the sun will come out soon, or I'll have to share some gloomy photos next time. Wahoo, you guys! It's finally about time to plant outside at my house. I like to wait until around Mother's Day since it's pretty safe, weather-wise. That being said, it could still snow a little bit this week. Twice in the past, my newly-planted garden has been demolished by hail. Now I understand why farmers are so obsessed with the weather! If you plant too early, a freeze or hail storm might wipe you out. If you wait too long, the crops won't have a long enough growing season before it gets cold again. To find out when to plant where you live, you can ask experienced gardeners, or search by your zone or state to get advice. Here is a site where you can find out your gardening zone. And here you can find out your average last frost date. Some things can be planted before this date. Read your seed packets to see what it says for each type of plant. 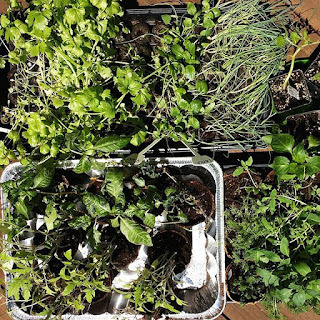 For our natural dye garden, herb garden, and vegetable garden, we've planted lots of seeds inside and now they're big enough to move outside. Hooray! But we don't plant them right away. The seedlings are used to a fairly consistent temperature from being inside the house. They haven't felt much wind. The intensity of the sun's light and heat has been buffered by walls and window glass. They were watered regularly and were never drenched by rain or parched from a hot, dry time between waterings. To help seedlings acclimate to living outside, sit them in a protected outdoor place for a couple of days. I put mine on my back deck, right against the wall. The house blocks some wind, sun, and rain. The plants are close enough to the door that I can easily bring them inside if it gets too windy and they might blow away. Ideally, we'd plant on a day when it's cloudy and even misting a little bit. If you live in the Pacific Northwest, good for you! You might have a drizzly day right when you're ready to plant. The rest of us will have to do our best with the weather we've got. I recommend having your hose or watering can ready so you can water right away. If it's sprinkling, you may not have to water that day. If you make straight rows, you'll be able to mark them and easily tell what's growing where. This style of gardening makes it much easier to tell which little plants are wanted and which ones are weeds! If you don't worry about straight rows, you might be able to fit more plants into the garden. Some plants can go closer together if you give them enough food and water. I often plant in a messy, crowded way, and it works okay for me. For instance, I might plant my tomatoes in nice, neat rows, but then stick basil plants in between them. If you want to plant closely together, I have a few tips. One thing to think about is choosing different heights of plants to be next to each other so that they all get enough sunlight. A great example is the Native American tradition of planting corn, beans and squash in the same spot. The corn grows up very tall, so nothing blocks it from getting plenty of sun. The beans wind around the corn stalks without harming them, while also getting full sunlight. The squash stay low and get plenty of light as their leaves are wide and the corn and beans don't cast much of a shadow. This combination is also wonderful because corn needs a huge amount of nitrogen and beans add nitrogen to the soil. Adequate nutrition can be provided by feeding well on a regular basis, but it's so nice when the plants work together! Other things to consider when choosing plants to go together are insects and disease. Some plants help protect each other by emitting a smell that's offensive to insects that would eat the other plant. Some plants attract insects that help the other plant by eating aphids or by pollinating the plants. On the other hand, some plants are in the same family and they can spread diseases to each other, so it's better to keep them separated. Tomorrow I'll tell you how I'm laying out my garden beds, with friendly plants next to each other. Hi guys! Today I'm listening to a fun podcast about natural dyeing. Kristine Vejar is interviewed on While She Naps. Vejar wrote The Modern Natural Dyer, which is one of my favorite books on the subject. It's laid out to be easy to use and it's beautiful. She also owns a store called A Verb for Keeping Warm, where she sells yarn and fabric that were naturally dyed. It's a good interview and is adding to my excitement about planting a dye garden this year! Check it out. The rosemary plants I'm growing are not yet ready to use, but I can't wait to share this recipe with you. It works perfectly with dried rosemary, so using store-bought is great. If you have a big enough rosemary plant, harvest it fresh! This is a spicy snack that makes a great gift (do you need a teacher gift this month?) or part of an appetizer spread, or just to snack on constantly until they're gone. *If you only find roasted cashews, no problem. Just skip Step 2. If your cashews are presalted, don't add more salt. Step 1. Preheat oven to 375 degrees Fahrenheit. Step 2. Spread the cashews on a parchment-lined baking sheet, in a single layer. Roast for 10 minutes. Step 3. While the nuts are in the oven, mix the remaining ingredients together in a large bowl. Step 4. Remove the cashews from the oven and add to the other ingredients. Mix well to coat the nuts. Step 5. Return the nuts to the lined baking sheet, in a single layer. Place them in the oven to cook for 5 - 8 more minutes. Remove from oven and let cool. Hot nuts have a strange, chewy texture, but they will be crunchy as soon as they cool off. Step 6. If you don't eat them all right away, store them in an airtight container. The balance of flavors in this snack is so nice! I hope you'll give it a try.